Happy National CRNA Week – Say it Loud, Say it Proud! The American Association of Nurse Anesthetists extends a hearty “Happy CRNA Week!” to all CRNAs and SRNAs! You are the heart of an amazing profession that sees each patient safely through anesthesia care every day, every year. We salute and thank all of you for your hard work, kind words, compassionate deeds, and everything you do. From the rural areas to urban central to the far-flung corners of the world, CRNAs and SRNAs are getting it done. 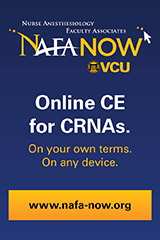 Happy National CRNA Week! Thank you for all you do! Happy CRNA Week from AANA Insurance Services! Thank you for being there – every breath, every beat, every second. It has been our privilege to help safeguard your career for nearly 30 years. On behalf of AANA Insurance Services, Happy CRNA Week! On January 11, 2018, the AANA submitted a comment letter to the FDA regarding drug shortages' impact on anesthesia care and proposed solutions. The letter describes CRNAs' experience with drug shortages, including clinical impacts on patients. These impacts include, but are not limited to, drug rationing and less effective care, increased risk of medication error due to new medication protocols, and increased side effects, complications and mortality due to drug substitutions. The letter also addressed economic impacts of the drug shortage crisis, methods CRNAs use to mitigate drug shortages, and potential strategies and policies to help alleviate the persistent drug shortage problem. The letter emphasized the AANA’s commitment to collaborating with the FDA, other healthcare associations, and industry to mitigate and resolve this complex problem that undermines patient safety. State Associations: Submit your entry for the Excellence in State Government Relations Advocacy Award, to be presented at the AANA Mid-Year Assembly in April 2019. This annual award is not tied to a specific “victory” in the state legislative or regulatory arena, but is given based on the quality of the state association effort. Examples of state association efforts include successful lobby days, legislative/regulatory efforts, or increased member participation in grassroots or other efforts. For more information and to submit your state’s application by February 15, 2019, visit the AANA website. The elected candidates then would be eligible to be considered for reelection to a second three-year term. The deadline to apply is March 15, 2019. For position criteria and application requirements, please visit www.coacrna.org. Ian Hewer, PhD, MA, CRNA, assistant professor and director of Western Carolina University's nurse anesthesia doctoral program, traveled to the Republic of Chad (Africa) with SRNAs Ben Woody and Jenny Della Posta late in the fall semester of 2018. The three, along with Della Posta's husband, A.J., were participating in a medical mission trip to assist a surgeon providing free services for residents of the village of Bere. Hewer provides a first-person account of the trip. Read more. Here are a few of the most common business mistakes and ways to overcome them. Envision Physician Services has a featured opportunity for a qualified CRNA to join our expanding team at Florida Hospital North Pinellas and surrounding ambulatory surgery centers. The surgery centers covered would include: Belleair Surgery Center, New Port Richey Surgery Center, Countryside Surgery Center, and Ambulatory Surgery Center Group. Learn more about this exciting opportunity and the benefits of working for Envision. Consider joining a company that encourages work-life balance and invests in their employees! Learn more. Envision Physician Services has an outstanding opportunity for a qualified CRNA to join our growing team in southwest Florida; covering St. Andrews Surgery Center in Venice, FL and Gulf Point Surgery Center in Port Charlotte, FL. Both locations are conveniently located between the gorgeous city of Sarasota and beautiful Fort Myers. Learn more about this exciting opportunity and the benefits of working for Envision. Consider joining a company that encourages work-life balance and invests in their employees! Learn more. We are currently looking for a full-time permanent Certified Registered Nurse Anesthetist (CRNA) to join our team for an Endoscopy Center located in Yuma, Arizona! Enjoy working in our state-of-the-art endoscopy center. No call, no nights, no weekends or holidays! Excellent Salary. Outpatient endoscopic facility. Learn more. The effects of neuromuscular blockade can linger after surgery, with new research estimating that as many as three-quarters of patients require immediate postoperative reintubation as a result. Led by Benjamin Matelich, MD, an assistant professor of anesthesiology at the University of Minnesota Medical School, investigators reviewed the records of 44 patients reintubated at a single site between 2013 and 2015. Although the absence of twitch monitoring in the postanesthesia care unit did not allow for a direct association between residual paralysis and reintubation, a scoring system based on a series of risk factors let researchers gauge the likelihood that persistent blockade influenced reintubations in the PACU. The scores found it "unlikely" that this was a factor in 38.5 percent of patients, "possible" that it was in 38.7 percent, and "probable" for 20.5 percent. Matelich, who reported the finding at the 2018 annual meeting of the International Anesthesia Research Society, said he and his team believe the results underscore the importance of monitoring for residual neuromuscular blockade in the intraoperative and postoperative periods. Due to study limitations, however, they say the results should be considered speculative. From "Data Show Role of Residual Neuromuscular Blockade in Reintubation"
Research points to same-day discharge and other benefits for mastectomy patients who receive liposomal bupivacaine as part of a multimodal pain protocol. Investigators at the University Medical Center New Orleans followed 72 women who underwent the surgery between November 2015 and July 2017. Nerve block with liposomal bupivacaine—administered in conjunction with intraoperative IV acetaminophen and IV ketorolac—resulted in less opioid use during recovery, reduced need for antiemetics, and lower postoperative pain levels. "If the nerve block is performed properly, the vast majority of patients wake up in the recovery room with little or often no pain whatsoever," said surgical oncologist Adam Riker, MD, the study's lead researcher and author. He hopes the findings encourage more clinicians to readjust their pain control strategies for this population, which could facilitate more outpatient mastectomies. In turn, Riker believes patient satisfaction could improve and costs could be reduced. The findings were presented at the 2018 Clinical Congress of the American College of Surgeons. From "Pain Protocol Facilitates Outpatient Mastectomy"
A pilot study out of China measured the safety and efficacy of using ketorolac in combination with a multimodal drug strategy for pain control after shoulder arthroscopy. The researchers randomized 60 participants in a 1:1 ratio to receive ropivacaine, morphine, and triamcinolone acetonide or the same regimen plus ketorolac. Patients in the ketorolac group reported lower Visual Analog Scale (VAS) scores during every interval checked during the first 48 hours postoperatively, with the exception of the first 60 minutes. On movement, the VAS scores were lower with ketorolac than without at 24 and 48 hours postoperatively. Meanwhile, there was no additional anesthesia demand for 60 percent of the ketorolac patients compared with just 33.3 percent of the controls; and lower doses were required for those patients in the experimental group who did need it. Initial analgesic desired time was significantly delayed with ketorolac. The findings indicate that adding ketorolac to intra-articular injection analgesia is viable pain relief after shoulder arthroscopy, although additional studies are needed to inform treatment guidance. From "Effect of Ketorolac in Intra-articular Injection Analgesia for Postoperative Pain in Patients Undergoing Shoulder Arthroscopy"
Journal of Pain Research (01/19) Vol. 12, P. 417 Xu, Jianda; Qu, Yuxing; Li, Huan; et al. While clinicians understand that patient positioning can impact local anesthetics, researchers recently studied this effect for the first time in the specific setting of greater occipital nerve (GON) block. In all, 95 patients with treatment-refractory headache disorder were administered GON block as part of the prospective, non-randomized study. Based on patient preference, 34 participants sat up and 61 reclined for 10 minutes immediately post-procedure. In the upright group, 29 percent of patients said they felt substantial relief for a median 25 days and 18 percent said their pain was completely resolved for a median 119 days. In the supine group, by comparison, those percentages were 44 percent for a median 70 days and 28 percent for a median 84 days, respectively. The results, reported in Clinical Neurology and Neurosurgery, suggest that lying down could improve treatment outcomes after GON block; but the investigators agree that a multi-site, randomized controlled trial is needed to confirm their findings. From "Supine Positioning After Greater Occipital Nerve Block May Improve Outcomes"
Clinicians are overprescribing opioids to pediatric patients after surgery for a common elbow injury, researchers report. The prospective study out of Children's Hospital of Philadelphia (CHOP) included 81 kids, with a mean age of six years, who were suffering from a supracondylar humerus fracture. On average, the children used less than a quarter of the opioids they were prescribed after closed reduction and percutaneous pinning of the break. Although younger children are less likely to abuse opioids, there is still a risk of accidental ingestion of leftover medication. "This study suggests that orthopaedic surgeons really need to think about our current prescribing practices and how we can help decrease the potential for overprescription and opioid diversion," said lead study author Apurva Shah, MD, an orthopedic surgeon at CHOP. "Based on this study, which we believe can be applied to other common types of orthopedic injuries, a prescription for a much shorter period of time seems to be appropriate." The findings are reported in the Journal of Bone and Joint Surgery. From "Surgeons Find Opioids Often Overprescribed for Elbow Fractures in Children"
Effectively managing pain during root canal is critical to avoid fear and anxiety, prevent other medical issues, complete the procedure within the normal time frame, and maintain the provider's reputation. To this end, researchers performed a systematic review and network meta-analysis to determine what approach delivers superior pupal anesthesia for Inferior Alveolar Nerve Block (IANB) during the treatment of irreversible pulpitis. They ultimately included 11 randomized clinical trials that compared two or more anesthetic solutions in this setting. 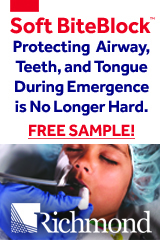 The collective study population was 750 adults; and five different anesthetics were scrutinized. According to the data, only mepivacaine significantly boosted the success rate of IANB compared to lidocaine, but it did not perform similarly in comparison to other anesthetic agents. After mepivacaine, prilocaine had the biggest impact on IANB success, followed by articaine, bupivacaine, and lidocaine. The results of the review suggest that mepivacaine with epinephrine offers the best chance for effective anesthesia during IANB for irreversible pulpitis. More high-quality clinical trials are warranted, however, to validate the findings. From "Efficacy of Local Anesthetic Solutions on the Success of Inferior Alveolar Nerve Block in Patients with Irreversible Pulpitis"
International Endodontic Journal (01/14/2019) Nagendrababu, Venkateshbabu; Pulikkotil, Shaju Jacob; Suresh, A.; et al.